The reason that it makes sense to consider the home-network issue, especially wired-in Ethernet, is because an increasing number of households are using two or more computers. Infact, there is an increasing trend for households to have more computers than TV sets. As well, computers can and have now become entertainment centres for bedrooms and other small areas thanks to optical-disc drives, sound-card setups and radio and TV-tuner kits that install in or connect to PCs. There is also an increasing common practice to copy CDs to the computer’s hard drive so that these computers double as personal jukeboxes, which is an asset with small areas. This means that there is a desire to have access to resources like the Internet and printers from all the computers that are in the house. Similarly, there is an increasing number of consumer entertainment devices that can connect to the home network, primarily for access to online content or content that is held somewhere on that network. 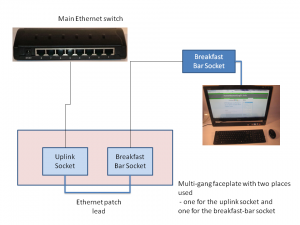 Most of these devices, such as Blu-Ray players and smart TVs, are using Ethernet as a baseline connection method with Wi-Fi, whether integrated or as an add-on module, as an alternative connection method. As well, a games console is now considered “well-bred” if it has a network connectivity option, with the two most-desireable consoles – the Sony PlayStation 3 and the Microsoft XBox 360 – having Ethernet connectivity at least. This means that these consoles can be integrated in online gaming scenarios as well as having access to online or network-hosted entertainment material. If you have networked your computer equipment by using a “no-new-wires” method like wireless or HomePlug powerline; you may be dealing with a network that isn’t working at its best. This is because the “no-new-wires” technologies work on having the “no-new-wires” segment’s bandwidth shared by all the devices that connect to the segment. It is exemplified by poor response time during a network multiplayer game hosted across the “no-new-wires” segment or slow transfer speed whenever a file is being transferred between two nodes on the same segment. 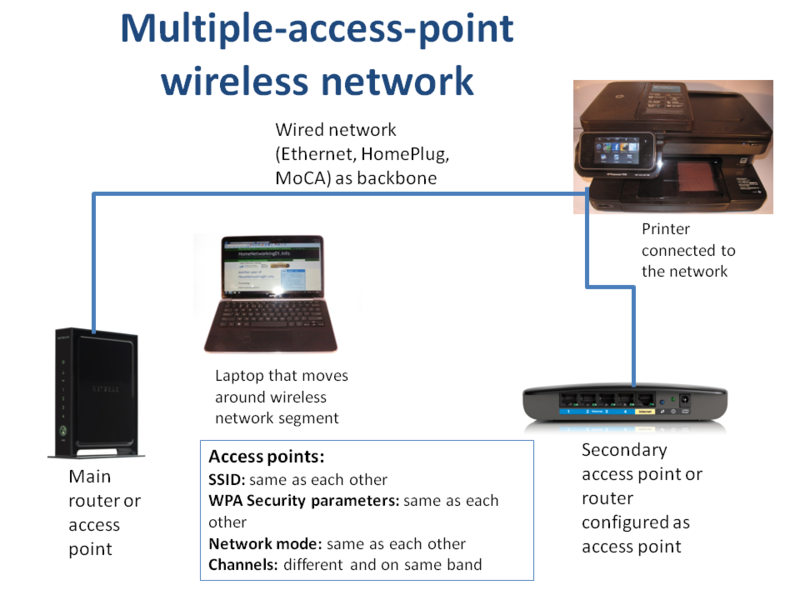 Typically, when you implement a “no-new-wires” network, you would use a broadband router that connects to an Ethernet segment and the “no-new-wires” segment on the LAN side, like one of the many wireless Internet gateway devices. Also, if you decide to add on extra network devices that don’t have integrated connectivity for the “no-new-wires” technology, you would have to buy extra network bridges so these devices can work as part of the network.The possibility of high-speed Ethernet being available for home-computer users is made real through high-performance Ethernet network-connectivity devices being made affordable and ubiquitous for most users. You will benefit from the high data throughput that Ethernet provides especially now that 1 Gigabit/ second is now becoming the norm for these setups due to affordable Gigabit Ethernet switches. This will benefit applications like Internet gaming, network media streaming such as Internet radio and video-on-demand; as well as graphics-rich printing. There are infact some situations that may drive you to consider wiring your house for Ethernet, as outlined below. A major trend that either is occurring at the moment or will be occurring over the next few years is the rollout of next-generation broadband Internet services. These services are typically based on a fibre-optic backbone with some providing fibre-optic connectivity to the customer’s door, and have a very high headline speed of at least 50Mbps for each customer. These services will typically provide a “triple play” service with landline telephony, broadband Internet and multi-channel high-definition pay TV as part of the one service, delivered through the one high-speed pipe. You may experience a triple-play service with your broadband Internet service but the next-generation broadband service will provide the extra functionality like many full-HD video streams at once, HD-audio telephony with FM-radio clarity for voice communications, or video telephony that isn’t just confined to Skype or science fiction. Of course, Ethernet would work well with these services by allowing the full bandwidth of these services to be exploited. This is because the high-speed data communications that the next-generation broadband services provides can be fully attained due to this connection being an “in-home data expressway” for the network. Here, it will benefit large file transfers that will become the norm as media content and computer software is delivered “over the wire” rather than as physical media. This also includes supplementing games with downloadable content such as characters or scenarios that add play value to the game. This is even though the Wi-Fi wireless or HomePlug powerline technology will still work on shared bandwidth and work as a complementary setup for portable or ad-hoc-positioned devices. This leads me on to talk about Internet-hosted video delivery services that are increasingly becoming the norm for video sources. Here the desire is to view these on the large-screen lounge-room TV and other TV sets in the house; and this application is being considered as a key application, if not the killer application, for the next-generation broadband networks. This is being facilitated on two different grounds – one being to provide content that is either complementary to or an extension of what is offered by broadcast TV providers and the other is for telecommunications companies and Internet providers to distribute multi-channel pay-TV via the same Internet “pipe” as the telephone service and broadband Internet service. The first situation, which is highly common in the USA, is to provide “over-the-top” video service where the Internet “pipe” is used by another operator to distribute streamed or downloaded video content independent of the established broadcasters. It manifests in the form of “download-to-view” video-content services like Netflix and Hulu or “complementary cable services” which provide channel groups that may not interest the main cable-TV providers, such as wholesome family entertainment or overseas / expat content in the US. Increasingly, network-enabled video products like games consoles, TVs and BD-Live Blu-Ray players are now using apps or extensions that support broadcaster “catch-up TV”, complementary-TV or video-on-demand platforms. In this same manner, some users in the USA are looking towards “cutting the cord” – discontinuing their pay-TV subscription with their cable or satellite TV providers in order to save money and / or reduce exposure to the “many channels, nothing on” culture of cable TV there. Here, they are looking towards the “over-the-top” providers for content that would otherwise be on these cable TV services. The second situation that is currently common in Europe, is “IP-TV”. This is where content from established free-to-air and subscription TV broadcasters is transmitted via an existing IP-based Internet-capable network. This method is being pitched as a way of using DSL or fibre-optic-based next-generation-broadband to distribute Pay-TV signals to subscribers. It has become more common with the ISPs and telcos moving towards offering the “single-pipe triple-play” services with regular telephony, Internet service and multi-channel pay-TV from the same entry point. This setup involves the telco or ISP providing the customer a set-top box (STB) or personal video recorder which plugs in to the router via an Ethernet cable. As far as this application is concerned, a house that is wired for Ethernet is at an advantage for these “IP-TV” service. It benefits security of the conditional-access system in pay-TV applications because it is harder to unnoticeably “sniff” out conditional-access key values before they reach the set-top box; and there is a high quality-of-service due to the nature of “switched Ethernet” where high bandwidth and low-latency is assured for full-screen video. Also there is the ability to extend the service either through a “portable” setup where the set-top box is relocated at will or through having extra set-top boxes connected to secondary TV sets, this being a feature increasingly offered as a value-added option. Of course, the Ethernet backbone will provide for improved quality-of-service that is needed for the full enjoyment of streamed and live IP-delivered video content. This then leads to the wireless network being primarily of benefit to those devices that gain the most benefit from it i.e. portable or transportable equipment like laptops, smartphones and tablets. This situation would mainly affect most pre-1950s brick houses with thick brick walls because such walls can easily attenuate the short-wavelength radio signal that wireless networks use. In some of these houses that have been recently extended, the wall that joins the extension to the main house is often a very thick one because it used to be the outside wall, and therefore becomes the point of attenuation for the short-wavelength wireless-network radio signals. The same situation can affect houses with chimneys that are on interior walls that adjoin rooms. In these houses, especially where there is a fireplace or the remnants thereof in both adjoining rooms, these walls are noticeably thick in order to accommodate the chimney and this situation can lead to poor wireless-network performance. It can also affect buildings that are insulated with foil-reflective insulation or use the new-look corrugated-iron wall as an outside-wall style. In the same manner, you can use HomePlug AV powerline networking to complement the Ethernet network by catering to those devices that can only use this technology; or as a secondary wired-network setup for ad-hoc use. This is done using a HomePlug-Ethernet bridge and that functionality may be built in to those routers and other devices that support HomePlug, as well as Ethernet and/or wireless as a LAN medium. Whether you have one computer or many on your premises; or whatever kind of internet service you are using, the improvement brought about by wiring for Ethernet will be seen as enhancing capital value for your premises. This may certainly pay dividends whenever you sell the house or let it out at a later date, because of the concept of pervasive broadband Internet becoming a reality. This brings with it a desire to wire up multiple computers to a network in order to share the high-speed Internet connection. The best time to do this kind of work on an existing house is whenever you are doing works that are involving the house’s electrical system. This would involve rebuilding; refurbishing or extending the building or rewiring the building to comply with modern electrical-safety codes. It is also best done when you are constructing a new building from scratch and I would suggest that you raise this issue with your builder or architect during the planning stages. If you are installing an alarm system or doing similar work where new electrical infrastructure is being laid, you could have the Ethernet wiring laid at this point. This works best if the tradesman that you engage is competent at all facets of infrastructure work and will do this as part of the job. If you are on a shoestring budget, you may just focus on wiring the study / home-office and the main living areas in your house such as the family room and the formal living room or rumpus room. 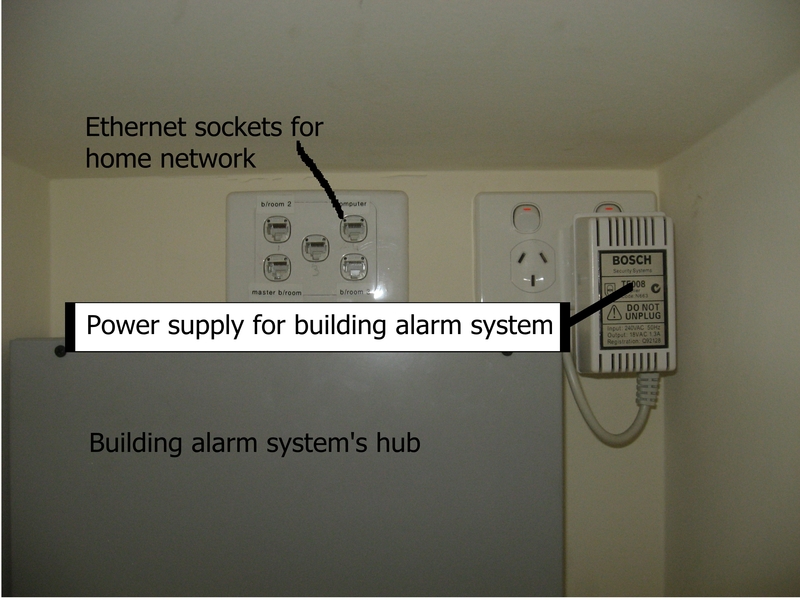 In this case, it is also worth making sure that there is an Ethernet connection on each floor of the house and at each end of the house. This is more important for older brick or stone houses that have been extended, so you can set up an extension access point that assures proper wireless coverage past the brick wall that separates the main house and the extension. Then if you need wired network coverage in the rest of the house, you can use HomePlug AV hardware to cover those areas. But if you do intend to factor in adding extra Ethernet points at a later stage, you may want to make sure you can run that extra wiring through your house. The places that would come to mind are any built-in storage cupboards like the broom cupboard, the linen press or a built-in wardrobe in one of the bedrooms. You may use a place like the attic or basement. Some of you may want to place the switch in one of the cupboards in the home-office because this would be where the main “Internet-edge” router would be located and you could have the switch co-located with that router. As I have seen for an alarm-system installation, you may use the wall hidden by the laundry door when it is open as a central location for the network switch. Ideally you shouldn’t use a room which is used for any heat-generating systems like hot water tanks, boilers or furnaces. This same location idea also allows you to establish an installation point for any devices that provide “back-end” functionality for the home like network-attached-storage devices. It then means that you can service all these devices by going to one location. You may also have to be sure that you have enough space near the system’s central box and room at the power outlet to plug in another “wall-wart” power supply so you can install the Ethernet switch without reliability problems for the network and the alarm system. You could achieve this by using a good-quality power board (power strip) that has many power outlets on it and mount this on the wall, thus plugging your Ethernet switch, alarm system and other devices in to it. As for the switch, you should purchase a Gigabit unit with more ports than there are rooms to wire. This allows you to add extra network points at a later date or connect network devices like Ethernet-powerline bridges, wireless access points, network-attached storage or home-automation equipment directly to the switch. The preference for the Gigabit switches is driven by the fact that most desktop and mainstream laptop computers that have an Ethernet socket have this socket as a Gigabit Ethernet socket. Similarly, it is an expected feature that a well-bred network-attached storage devices on the market have this kind of high-speed connectivity. This also future-proofs the network for 802.11ac “Gigabit Wi-Fi” access points and the next-generation broadband services that are coming on the scene. A brand that is still worth looking when you want to purchase Ethernet switches that are value-for-money is NETGEAR. From my personal experience and observations, this company has been known to be the first to offer particularly-desirable functionalities for these devices at reasonable per-port prices with such things as cost-effective five-port and eight-port switches, including some affordable Power-Over-Ethernet power-source models. 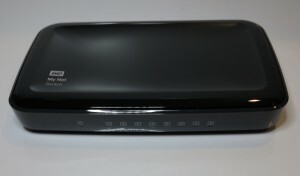 You will usually have the network-Internet “edge” router, whether it is the typical ADSL modem-router or a broadband router connected to a cable modem or similar broadband-technology device, either in the study, the home office or the main lounge area and will most likely have Ethernet-enabled devices located close to it. 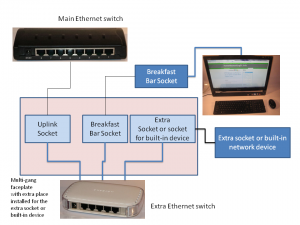 Here, you would connect one of the router’s Ethernet ports to the Ethernet installation while having the other sockets available for the other Ethernet-enabled devices like a games console, network-attached storage or network printer. An increasing number of newer mid-range and high-end routers are coming out with all of the Ethernet ports being Gigabit Ethernet ports rather than the typical 10/100Mbps Ethernet connections offered on this class of device. This will be of benefit when you wire your home for Ethenet and want to have this backbone work at best speeds with the currently-available cost-effective Gigabit Ethernet switches. When choosing the socket type for the room sockets, it is best practice to use a standard wall-mount socket for each of these sockets. You may be tempted to use a side-entry socket, which is similar to some TV aerial points that have been commonly used in Australia or the older Telecom Australia telephone connector and these may work out for areas where space may be too tight due to furniture being placed against the wall. The only limitation with using a side-entry socket is that you may experience difficulty plugging and unplugging the device from the socket especially if the cable has the cheaper crimped-on connector. If the job is aesthetically sensitive, you may be able to find outlet plates that work with the aesthetics of the room where the sockets are installed. This is easy due to the use of standard wall fitting designs that permit manufacturers to supply a large variety of trim-plates or socket modules. This can be of importance to anyone who owns a home that is styled to periods before the beginning of the “neat” 1960s and want to make the fittings reflect that style. One way to assure expandability for future network needs while saving costs on the current project is to create an “expansion loop” in areas where you may want to install built-in or concealed network devices or extra Ethernet sockets at a later date. One example may be the entertainment centre in the main living area where you may house your network-enabled home entertainment equipment in a cabinet. You may of course have an exposed Ethernet socket for the Internet-enabled HDTV or similar equipment. By installing two Ethernet sockets in a cupboard such as the pantry, entertainment cabinet or built-in wardrobe, you would achieve this ability to cater for this situation. One of the sockets is wired to a visible point that is in the main area, such as at the breakfast bar. The other is wired to the main Ethernet switch for the home network. When the time comes to add a built-in Internet terminal or similar network device, or add extra network sockets in to that area; you or an installer, runs a short run of Ethernet cable from the new device’s or new socket’s location to where the two Ethernet sockets are. Then, a socket is installed at the device’s location and another Ethernet socket is inserted in to the abovementioned multi-gang faceplate and these sockets are connected to the Ethernet cable run. You then use a 5-port switch to connect this device and the existing network socket to the existing network backbone. Here, the switch is uplinked to the main Ethernet switch while the existing Ethernet point and the new device are connected to other ports on the switch. Is it worth it to put full broadband in the “family house”?